Pepe had this for dessert Sunday and Monday this week. The apple butter is courtesy of my two SIL's Cathy and Jennifer. Pepe heated the apple butter up in the microwave and it was delicious! YUM! Have you tried the Apple Dumplings from the Pioneer Woman site? This reminded me of them. 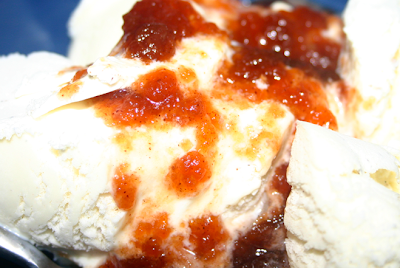 They were really good and easy and we poured the apple and butter sauce over icecream-so good!